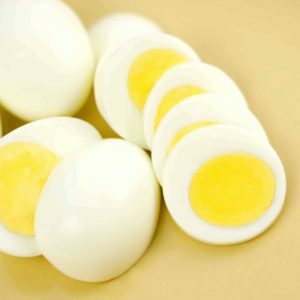 Perfect Hard Boiled Eggs with creamy yellow yolks and easy to peel shells. How to hard boil eggs the easy way! Place eggs in a large saucepan or Dutch oven. Do not over crowd the pot, make sure there is enough room for water to circulate around each egg. If there isn't, work in batches of 6. Add baking soda or vinegar. Fill pot with cold water to about 1/2 inch above egg tops. When water reaches a full boil, remove from heat and cover. For large eggs, cover for 10-12 minutes. Immediately remove eggs using a metal slotted spoon and submerse in an ice bath to stop the cooking process. Run under cold water and gently break and remove the shells. If you've tried this technique, come back and let us know how it was! Make them in the Instant Pot!